I don't know about you, but when I saw the nutty squirrel, I laughed out loud and had to have him!! He's so nutty....just like me. We were meant to be together! LOL I put this card together just waiting for him to appear in my mailbox so I could add him to the front of the card, and he didn't disappoint. I also used the loopy edge border, in keeping with the loopy/nutty theme, of course! Isn't he a nutter!?? For extra texture, I've used fabric paints on the heart, acorn and oval frame behind Mr. Nutter. These papers are Tree Love by Nikki Sivils. Cute, huh. I love the Cottage Cutz fall collection and this hay wagon is another of my faves. I've used the patch of grass from the scarecrows die also. You can never go wrong with stickles. Stickles always add a little pizzazz! For the inside message, I again used the nutty squirrel. He's so cute! As well as the sign from the pumpkin patch die and the grass from the scarecrows die. 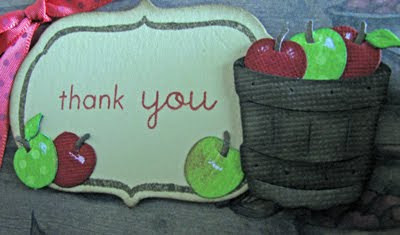 The letters for the message on the sign are also from the pumpkin patch die. The "w" is just the "m" turned upside down. I got a fun package in the mail yesterday, it was my fall CottageCutz dies. The hard part was figuring out what die I wanted to use first. 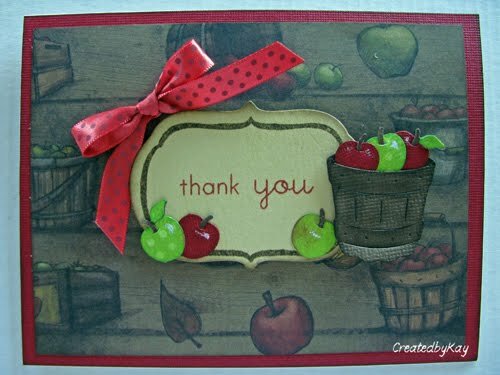 I had a piece of this Karen Foster patterned paper sitting in my stash so I decided to use two of the mini dies: the apples and the basket. Even these mini dies give you options, I love it! There are two different shaped apples, a stem and a stem with a leaf all on this mini die. I just used the one shape for my apples so they'd match my paper. The basket was so quick and easy and has a slit at the top so you make things fit inside. I love fall and all the baking and fun crafts that come with it. Dinner is ready, come on in. . . .This weeks card is using the Cottage Cutz Witch with Cauldron. I made a shadow box style card that folds flat. The front of the card was cut with a arch shape. I cut random pieces of silver card stock and played with them a while with scissors. . rounding the corners. . doing the stone shape. weathered the stones with a sponge using black and white ink, and a few crack lines with a white gel pen. I wanted spiders and webs, so I used a needle and thread and sewed back and forth between the stones and added a few spiders. I added a spider to the end of the thread and let him dangle over the pot. I wanted the witch to be in her most stylish wart-mart dress, so I used a white gel pen and added a few curls and swirls. I know it is hard to show, but the edges of the card are cut with a wide cut deckle scissors from Fiskars. Crafting Edger scissors are a little (lot) out of fashion, but I still use them . . particularly the deckle style. As you can see with the photo above the bottom cut is the full deckle, in this case I wanted to keep the card shape still straight at the edge, but have a random odd cut design. . Notice the top cut, I only cut half way up the paper. It's almost like something chewed on it a little. Here is the box shape from the top. There is two sheets of black card stock 7" high x 7 1/2" wide . Score twice on each side of the card stock at 1/2" each. This allows you to fold and have tabs on the side of the card to glue together. When you want to fold flat, just pull the end tabs and the card will go flat. Push the tabs back inward and the card will fold back to a box. 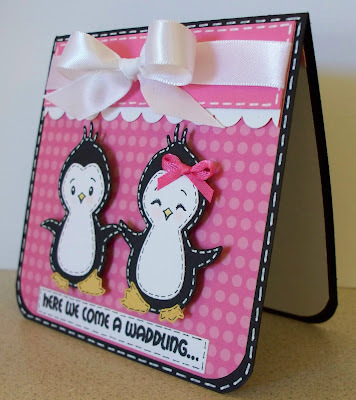 I used the deckle scissors on both the top of the card and the side tabs. The face of the card is 5" x 7" when finished, the window is cut about 4 " x 5 1/2", when you add the stones and glue them with an overlap the hole is about 3 1/2" x 5'. The card is 1" thick when open. Good morning! Today I have another Fall card to show you. I hope you aren't getting tired of them already. I love Fall. This year there has been an unusually high number of acorns falling from the trees. Thankfully I haven't been beaned in the head by one. This little squirrel is gathering acorns for the winter. You can find him here. I also used the Indian Corn die. I love this die! I used raffia to make the cornstalk. Happy Fall was cut from a coloring book. The leaves on the bottom were given to me in a Fall toss. The smaller leaves were cut from patterned paper. I used a Martha Stewart border punch to cut the grass. Have a fantastic week everyone! See you next Monday! Hello! It's me, Nikki! I have a fun little winter card for you today. 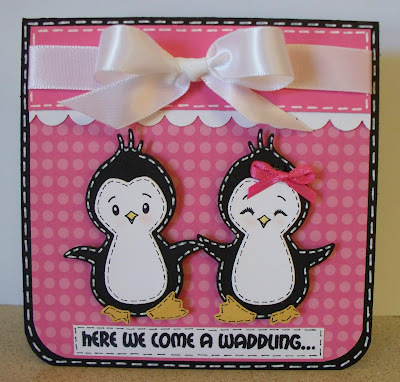 I used the Penguin Doll die. Aren't they cute?! This is just a pretty simple card. I hope you have had a wonderful weekend so far! See you next week! Since it is still so incredibly hot down here in Alabama (we are still hitting high 90's everyday), I figured I might as well work on some fun summer layouts! The beach dies from the Aug under the Sun Release are so much fun and are such must haves for all of your summertime activities. 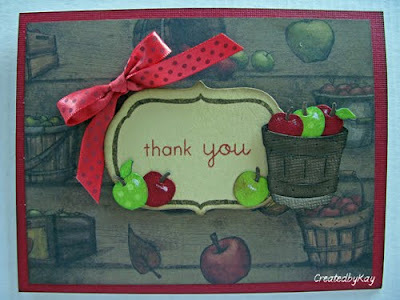 For my layout today, I am featuring the Cottage Cutz Pail and Shovel die. This die is another one of those great dies that comes with several different shapes any of which could stand alone. In my pictures, my girls were carrying their sand bucket to use to hold their crab catch. Therefore, I just used the bucket to accent my title. I "hung" the bucket from the curve in the letter "s" from my title to emphasize the bucket. I also used the Cottage Cutz Loops Edger to add some accents around the layout. I LOVE theses edgers because I did not have any ric rac the right color and I was getting irritating and then I remembered my edgers! Of course once I started looking through my edgers, I found my Loops one and decided to use that one instead of ric rac. I hope you have a great weekend and get a chance to do a little scrapping, too!! Good morning! For my post today, I'm sharing a layout I did using my Cottage Cutz Sandcastle and Seagull dies from The Scrapping Cottage. I used colored card stock instead of white this time, because the kraft card stock just worked the best for trying to achieve that sandy look, so as they say, "If it ain't broke... and, I'm sure you know the rest. I did do a little shading here and there with Copic markers, but not too much. I did lots of tearing and sponging on this page, and I used some twine to wrap around the posts for a more authentic look. The Life's A Beach title is computer generated, and I thought it would be cute to add that to the sand castle. I know I have pictures of my kids when they were little that will work just great with this page. Thanks so much for stopping by today. Have a wonderful day and I hope you get to enjoy some happy crafting! Papers for this project are from the Thrift Shop Collection by October Afternoon. For the 3D flower embellishments, I used the sunflower die, minus the stem, pot, and faces, from the Peachy Keen collaboration release. Instead, I used buttons with ribbon for the centers, and popped the layers with foam tape for a more dimensional look. In keeping with the play theme, I threaded ribbon through and around the title letters and cut two of each letter overlapping light over dark to give a shadow affect. 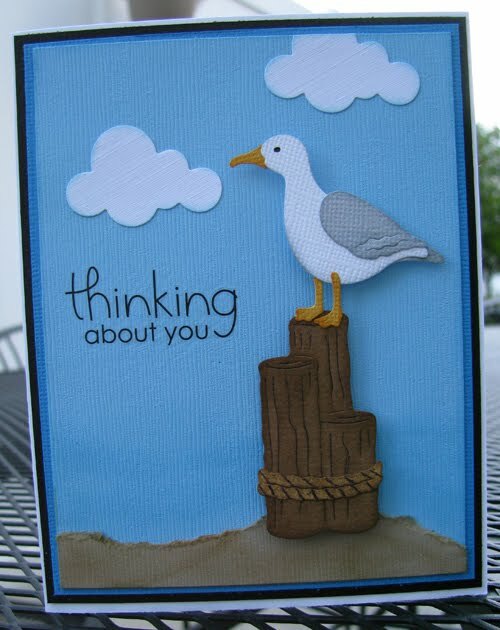 CottageCutz Seagull that I thought would be perfect for this type of card. This Seagull die would be great for those beach or boating layouts as well. You can also you the seagull and the wood separate too. Hopefully my cousin will enjoy receiving this card and my speedy recovery wishes inside. 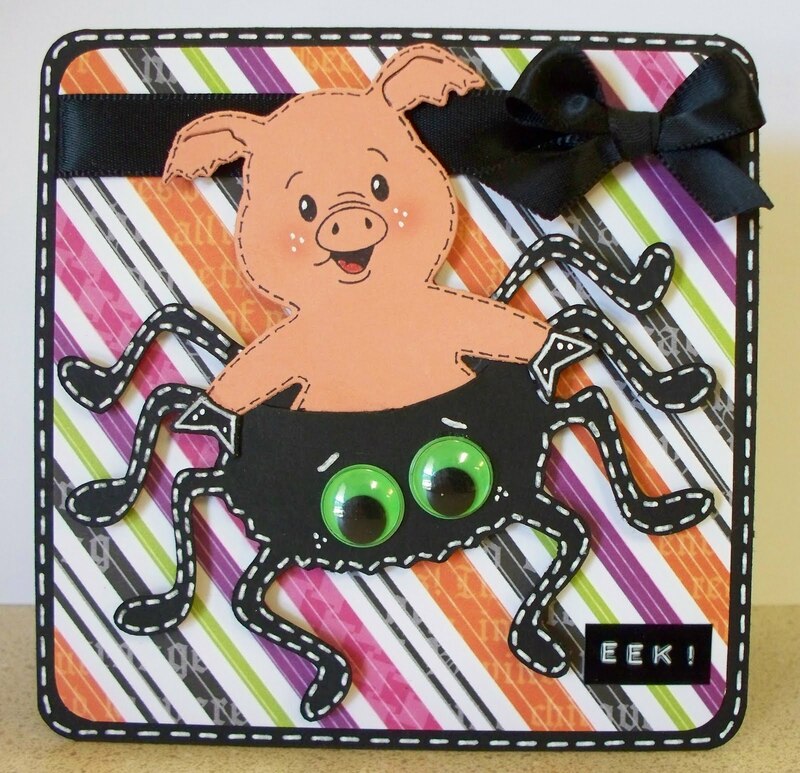 Dancing for a Treat!, This week I made a Card and matching Halloween Pin. I used the Cottage Cutz Ghost with Legs Die. The ghost legs dangle and dance. As you can see I decided I wanted the legs to dangle, I cut the normal leg s out of the die (in this case green) and cut the legs off at the top to create separate legs (rounded the edges). I used a pin to create holes in the base of the ghost and at the tops of the legs. Remember when you tie the legs, add a skewer or cut a q-tip and use the stick to tie the thread/knot on so there is a space in the loop of thread (than slide out after the knot has been double knotted). This is to make sure the legs hang even and loose. On the card I tied the knot in the back, on the pin I tied the knot on the front (I do like the knot w/tails showing on the front better). Also the triple paper on the shoes adds weight to the legs . . so they swing easier . This is the matching pin, I used a Spellbinder Label #11 Die for the base of the pin, cut the base white three times and glued the layers (this makes a nice stiff base) without cutting chipboard which can be a bit heavy on a small pin. What I forgot above is to use foam tape to put the ghost on, this adds dimension and also allows the legs to dangle freely without being pressed against the base. Good morning! I hope you all had a fabulous weekend. I participated in a couple of card workshops this weekend, so that is always a good time. I will post those cards later, on my blog. 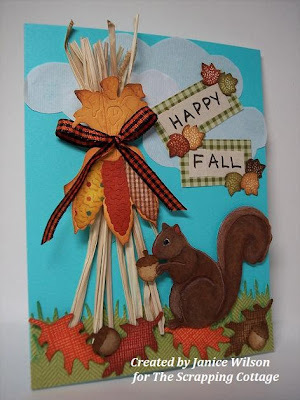 For today I would like to share this fun fall card with you. I am loving these cute crows! 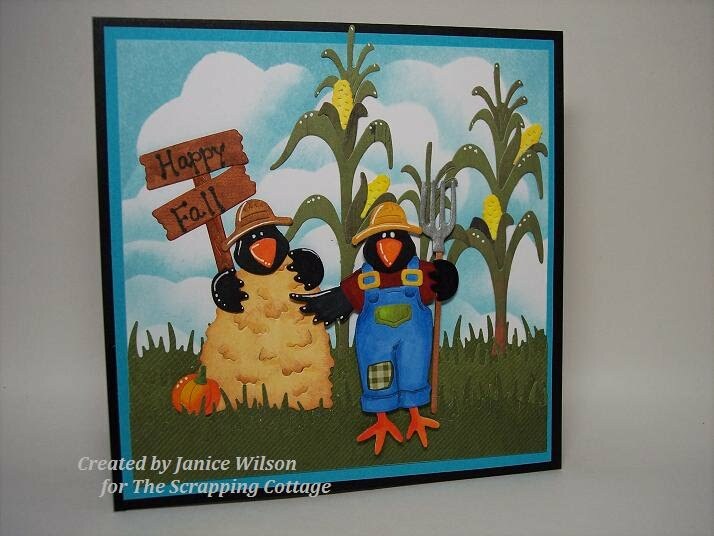 I used the Farmer Crow with Haystack and the corn stalk die for the corn field. I used parts of the farmer crow to have him hiding behind the haystack. I used the marker sign die for the Happy Fall. I started with a 5x5 white base. To make the clouds, I cut a cloud template from a piece of cardstock. I used a sponge and blue pigment ink. I would start at the cloud outline and push the ink away from me. Turn the stencil slightly and move down about an inch or so and repeat. They sell plastic cloud templates but cardstock works just as well, I think. The grass was cut with a Martha Stewart border punch. Have a great day and I will be back next Monday. If there are any dies or techniques you would like to see just leave a comment or send me an email. Thanks so much! I appreciate your visits and suggestions. Hello! Ok, I know this is WEIRD! Have you seen the Simpson's Movie? If not, this makes absolutely NO sense to you! LOL. In the movie Homer makes a little piglet walk on the ceiling and sings a song called Spiderpig. ♫ Spiderpig...Spiderpig...does whatever a Spiderpig does...Can he swing from a web...no he can't, he's a pig...LOOK OUT...he is a Spiderpig♫ So, basically if you're a fan of the Simpson's, you probably think this is as funny as I do! HAHA I AM A NUT! ☺ Anyhoo, I used the Pig Peeker die to make my hybrid Spiderpig. The spider came from one of my cricut cartridges. Happy "weird" crafting to you! Happy Saturday!! It is still really hot down here in Alabama, so I thought maybe if I started working on some Fall layouts, I could bring a little cool breeze my way! I have combined several Cottage Cutz dies together to embellish my layout today. The Cottage Cutz Mini Acorn and Mini Maple Leaf are perfect together! They also go great with the newest Fall dies from the Sept 2010 Release. I combined these shapes with the Cottage Cutz Stylized Tree and by changing the leaves to a golden yellow, it becomes a Fall tree! I also used one of my embossing folders on the top of the Stylized Tree in order to give it some texture. A lot of inking went into this layout as well to carry on the Fall feeling I wanted. Never forget to pull out older dies! Cottage Cutz shapes are specially designed for versatility and fun and will be useful accents on your projects for years to come! Have a great weekend and happy scrapping! Hello, happy Friday, and welcome to The Scrapping Cottage Blog. Here's what's kickin', and it's some fun with my Cottage Cutz dies from The Scrapping Cottage. Technically, we're talking about the country rooster die, here, but for all intensive purposes today, I needed a chicken, so a chicken it shall be. LOL!! You see, today I noticed on Splitcoaststampers that their challenge is to get punny with our cards, so this one I'm entering in the Free For All Friday Challenge at SCS. I've done this little fella in both patterned paper and white card stock, but for this card, I used the white card stock and colored with Copics, adding lots of texture with my markers. I really like using white, because I only have to cut once in my die cutting machine, then I can assemble and be ready to color. I'm so glad you could stop by today. Have you checked out all the wonderful creations our DT has submitted this week? 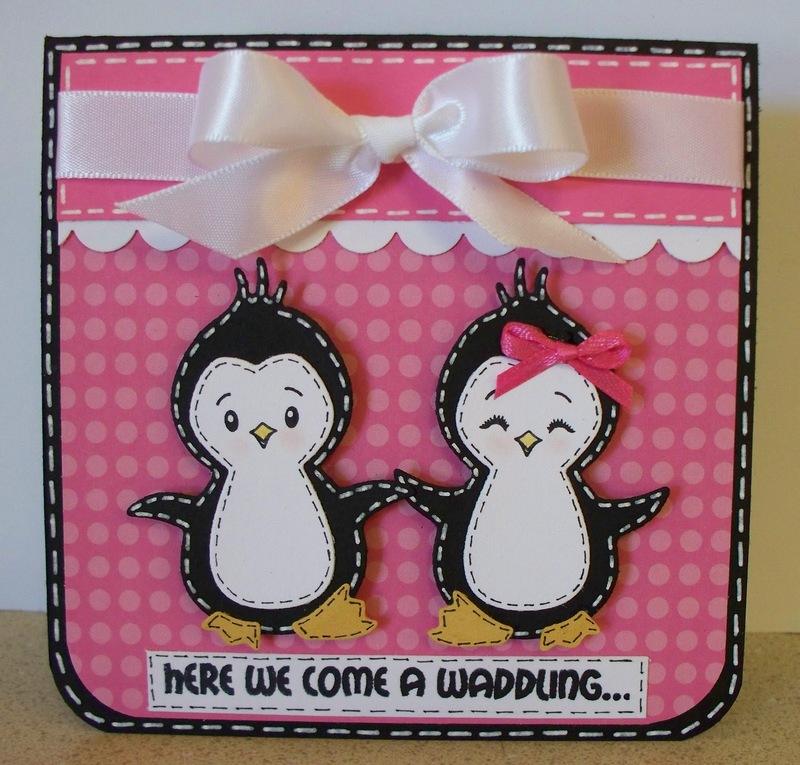 If not, then please scroll down and check out all the paper crafting goodness! It's absolutely inspirational, I tell ya! Have a beautiful day, and fabulous weekend, and enjoy some happy crafting! !